What’s good about this Disney Minnie Mouse bed? What’s not so good about this Disney Minnie Mouse bed? Is this the best Disney themed bed on the market? It’s clearly designed as a bed for fans of all things Minnie Mouse, but there’s a lot more to love about this bed. 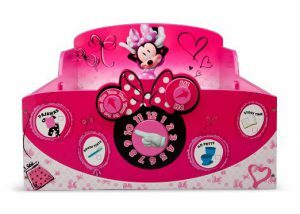 Featuring a pretty pink design and heavy Minnie Mouse branding, this bed seems like a no brainer for any little girl, but what else do you need to know about the product? Read on into our review to find out more about the advantages and pitfalls to this product and ultimately find out if it’s the best Disney themed bed you can buy. 2. What’s good about this Disney Minnie Mouse bed? The Delta Minnie Mouse Toddler Bed certainly looks like an impressive product, but it also has a pretty impressive range of features too. We’ve rounded up everything we love about this bed, so you can decide if it’s the best option for you. Design – We absolutely love the design of this bed. It’s pretty pink and perfect for any little girl. As we’ve already mentioned, the design also focuses heavily on the Disney character, Minnie Mouse. This is a character that any little girl or boy will instantly recognise and fall in love with their new bed because of. The product itself is a pretty standard wooden structure, but with this pretty pink Disney branding painted on. It’s a slightly less inventive method than what we’ve seen before, but it’s pretty pleasing nonetheless. It’s also worth noting that a Delta Micky Mouse Toddler Bed is also available, if you’re looking for a product better suited to little boys. Interactivity – The world is so exciting to most little ones that bedtime just seems like a boring chore. Thankfully, Delta Children have chosen to include a number of interactivity features within the bed’s design to make going to bed a little bit more exciting. These features including a movable clock that your child can change depending on the time of day. There’s also a number of removable reminders providing information about the important things that your child needs to do before bed. Build Quality – If there’s one thing we’ve come to expect from the products in Delta Children’s range, it’s fantastic build quality. We can safely say that this bed is no exception to that trend. As aforementioned, it’s a wooden structure that feels incredibly solid and ready to endure just about any physical damage that your children can push on it. 3. What’s not so good about this Disney Minnie Mouse bed? We may have laid out a pretty convincing argument as to why you need this bed from Delta Children, but there’s some not so good features to keep in mind too. Price – The biggest pitfall to this product is its price. It comes in at around $150, which may not initially sound that expensive. However, when you take into consideration what you’re actually getting here, you’ll need to decide if it’s worth the money or not. Bear in mind that the bed doesn’t include a mattress or any other extras. $150 may not be an awful lot of money to some people, but you should carefully consider how much you plan on spending on a bed before buying this product or opting for an alternative product. Q: Is it comes with mattress？What size mattress does the bed fit? A: No.It fits a regular crib mattress. Q: Does the package includes screws for assembly? Q: can i have an option to ship out of US? A: It only ship to the area of the United States of America comprising the 48 states that are south of Canada and north of Mexico. A: 3-5 years old(Recommended for ages 15 months+). In conclusion, we’re not sure if this is the best branded bed you can buy, but it’s definitely up there in contention for the position. The Disney Minnie Mouse theme and added interactivity features are a nice inclusion. Generally speaking, this product should definitely make bed time all the more exciting and keep your little one engaged.